Upcoming 12-story, 300,000-square-foot mixed-use building to be developed in Cambridge's North Point district on 2.87 open acres of land. EF III will feature top-notch student housing, educational, office, and retail space, and will allow Education First (EF) and Hult International Business School to expand their North American operations, enhancing the institutions' existing North Point international campus and providing students with a new on-campus housing option. EF III's ground floor will feature a bike room, a fitness center, and a fitness-related retail space. Upper floors will contain a mix of uses, including approximately 161,343 square feet of student housing containing approximately 278 units and 500 beds across the top seven floors, 22,754 square feet of office space, 14,566 square feet of student cafeteria and restaurant space with approximately 400 seats, and 13,873 square feet of student lounge and administrative space. 59,695 square feet of above-grade structured parking will be located within the building. Open green space will be created on the EF III site, including a flex-field large enough to accommodate a 5v5 soccer match. A vegetated area in the western corner of the site, referred to as “West Park”, will provide a quiet public area for passive recreation and would feature attractive seating areas with planted trees. The project is being planned in coordination with the Department of Conservation and Recreation (DCR) and the Division of Capital Asset Management & Maintenance (DCAMM), and will provide $20.4 million in funding for environmental cleanup and the relocation and construction of a new permanent DCR maintenance and operations facility; an existing DCR facility is located on site. With the expected opening this spring, construction is in the final stages for Education First's new building in Cambridge's NorthPoint neighborhood. The new 12-story, 300,000-square-foot building will feature student housing, educational, office, and retail space. Open green space is also being created on the EF III site, including a flex-field large enough to accommodate a 5v5 soccer match and West Park, which will provide a quiet public area with seating areas. The install of the unique facade is nearly complete for Education First's new building in Cambridge's North Point Neighborhood. The 300,000sf project will feature student housing, educational, office, and retail space. This project will allow Education First (EF) to expand their North American operations while enhancing the institutions' existing North Point international campus and providing students with a new on-campus housing option. Construction is expected to be complete in Spring 2019. Exterior work is ongoing in Cambridge's North Point neighborhood for the new Education First building. This 12-story building will feature 300,000 sf of student housing, educational, and office space. The building will house around 500 students and feature a cafeteria, lounge, fitness center, and bike room. Planned in conjunction with the Department of Conservation and Recreation (DCR) and the Division of Capital Asset Management & Maintenance (DCAMM), the project will provide $20.4 million in funding for environmental cleanup and the relocation and construction of a new permanent DCR maintenance and operations facility. 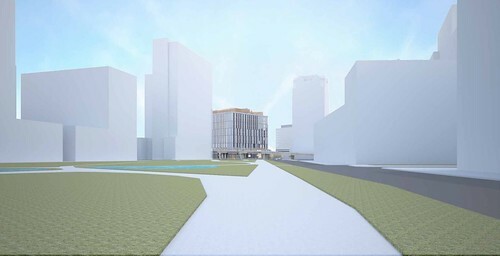 The EF III project will provide a link between the existing park spaces at North Point Park and North Point Commons and will activate a site currently barred from public use. Education First (EF) broke ground Monday (October 2nd) on a new 12-story, 300,000-square-foot mixed-use building adjacent to its’ existing campus in East Cambridge’s NorthPoint neighborhood. The building will provide EF and its’ Hult International Business School with their first on-campus housing option, allowing the institutions to expand their North American operations. The building will also help EF expand total Boston employment to 1,500 workers by 2020; 1,200 people are currently employed at EF’s Boston campus. The new building will be EF's third in Boston and will contain approximately 278 units with 500 beds across the top seven floors, 22,754 square feet of office space, 14,566 square feet of student cafeteria and restaurant space with approximately 400 seats and 13,873 square feet of student lounge and administrative space. Initial site work by W. L. French Excavating Corporation is now underway to prepare the EF III site for foundation construction; Skanska USA Building is EF III's general contractor. The State of Massachusetts has awarded EF $6 million in tax incentives to help subsidize the new building, and MassDevelopment will issue $25 million in bonds to fund road and sewer improvements. Education First proposes to construct a 300,000-square-foot mixed-use building in Cambridge's North Point district, the company's third ground-up North Point mixed-use building. The building, which would be located at 10 North Point Boulevard, would complement Education First's existing mixed-use buildings at One Education Street and Two Education Circle, providing new educational, office and retail space along with the company's first Boston-area student housing component. Construction of the proposed building is anticipated to commence in October 2017, with anticipated initial occupancy in Late Spring 2019; construction would take approximately 22 months. The City of Cambridge is now reviewing the proposed building.